MAS Holdings Pvt. 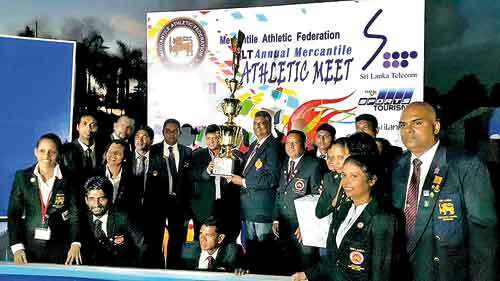 Ltd., with an outstanding team effort clinched the Overall Championship at the 34th Mercantile Annual Athletic Championship 2017 sponsored by Sri Lanka Telecom concluded at the Mahinda Rajapaksa Stadium, Diyagama. Best Athlete Over 45(Women) K. Gunatilleke, Best Athlete Over 40 (Women)-Dilrukshi Malkanthi, Best Athlete Over 30 (Women)-Indumathie Karunatilleke; Best Athlete Over 30 (Men)-Nadeera Viyanage, Best Athlete Novices (Men)-Vinod Lakshitha, Best Athlete (Men)-Nadeera Viyanage, Overall Masters (Women)-Runner-up, Overall Masters (Men)-Runner-up, Overall Championship- (Women), Overall Championship-(Men), Overall Novices Championship (Women), Overall Novices Championship (Men), Overall Championship (Women)-331 points, Overall Championship (Men)-236 points.